After a very short 7 hours of blissful sleep (being a mommy I can always use more ZZZ’s), we were ready to pack a lunch and tackle the plans we had made for the day. The first stop was the front office to get a complimentary city map of Sioux Falls to see what all may be along the way to add to our list of things to do and see. Lunch and drinks in the cooler, dog taken for a walk and we were loaded up and looking for new adventures. 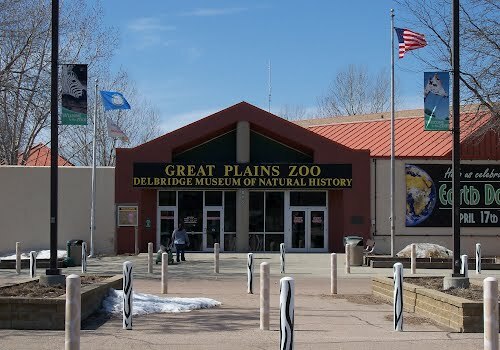 We made it to the Zoo pretty easy; Sioux Falls was not too hard to navigate, not as big as some cities we’ve been in but not as small as some of our favorite towns either. 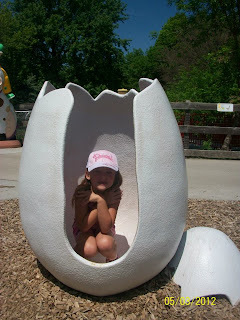 The lil one was super excited, we were about to add another zoo to our list of the zoos around the country that we have visited, we’re secretly trying to see them ALL! Once inside the gates the very first attraction to greet us was a walk-around museum of extinct animals with podiums of knowledge, where we could hear what they used to sound like. The lil one really enjoyed this part but was also very sad that man had taken so much of Mother Earth that we had hunted and driven these species to extinction, as I’ve said before, every step we take in life there is a lesson behind it. We have accomplished one of our goals, instilling a love and respect of animals, Mother Earth and life for every soul, be it homosapien or any other species on our planet. Unless it is to be eaten it is NOT to be killed; unless for protection, of course. We quickly went through the flamingos, alligators, lions, tigers and bears, as we had seen them on a weekly basis while living in Florida in sticks and bricks. They were working on several exhibits while we were there, never fails it is always our favorite animal enclosures that are being worked on, like the monkeys. We did get to see a huge Galapagos turtle, something Jacksonville didn’t have. The wild dogs, bison and pronghorns were pretty neat, but we were also looking forward to seeing wild bison farther west. I would have to say that the favorite part of this particular zoo was the Hy-Vee Face-to-Face Farm. In here we could buy feed to feed the goats, my favorite being the smaller pygmy goats. We could crawl through a tunnel to a turtle dome and view them at ground level, all of this was very exciting for the lil one, all we had done previously was feed a giraffe and stingrays in Jax. They even had a statue of a cow with utters to learn the art of milking a cow, of course we had to show the lil one how, as me and daddy grew up on farms. 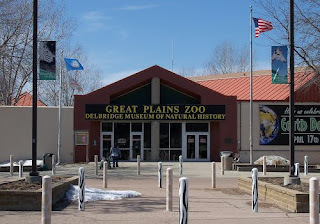 They had a ton of other activities to do here, the thing is, we’ve already done most of these at other zoos so we are picky on what we spend our time seeing. We tend to skip what we’ve already seen and head straight to the new sights to expand the ever-growing mind we created. There was a mining sluice where you could buy a bag of dirt, wash it and see what gems you were left with; knowing we were going farther into gold country, we saved the money opting to do some real sluicing in a creek in the mountains. What zoo wouldn’t be complete without the carrasoul, camel and train rides? Yep they had those too, but once again, we had already experienced those. We saw all we could see here before heading to a picnic table to rest for a bit and refuel the bodies. Soon we said goodbye to all the habitants of the Great Plains Zoo and were zooming down the road again on to the next attraction, Falls Park.